NYWIFT was founded in 1977 by a handful of women who felt New York needed a networking and education forum for women in the entertainment industry. Click through our history below to see how we grew from a meeting of 25 colleagues in a Manhattan apartment to a non-profit organization with a membership nearly 2,500 strong. Nicole Kidman lends her support to The Writers Lab 2018, in addition to returning funder Meryl Streep. The NYWIFT Women’s Film Preservation Fund (WFPF) brings a series of six programs of Second Wave Feminist films, mostly WFPF preservations, to screen at the Barbican Centre, London, in June 2018. NYWIFT membership reaches an all-time high of 2,400. 2018 Designing Women Awards are presented to makeup artist Martha Melendez, hair stylist Anita Lausevic, and costume designer Dana Covarrubias. The Variety Ensemble Award is presented to the hair, makeup and costume design team from the Amazon series Mozart in the Jungle. The Women Filmmakers: Immigrant Stories series returns to Queens, supported by City Council Member Robert Holden, and expands to include programming in Staten Island thanks to added support from Council Member Joe Borelli. In 2018, NYWIFT receives a donation of more than $50,000 from the Ha Phuong Foundation, and names three programs to provide additional opportunities, growth and acknowledgement for women: HP Training Program for Recent High School Grads, the NYWIFT HP Scholarship, and the HP Apprenticeship Program for Women Entering the Industry. The 2017 Muse Awards are presented to: actors Laura Dern and Judith Light, and Refinery29 Chief Content Officer Amy Emmerich. The inaugural Nancy Malone Directing Award is presented to Julie Dash, and Regina K. Scully, Founder and CEO of the Artemis Rising Foundation, received the Loreen Arbus Changemaker Award. The Mayor’s Office of Media and Entertainment commissioner Julie Menin presents the new MOME Made in NY Award to actor and producer Alysia Reiner, and keynote remarks are given by Lieutenant Governor Kathy Hochul. Executive Director Terry Lawler is honored with the Women in Arts & Media Coalition’s VintAge Award. NYWIFT receives a bequest of $340,000 from The Nancy Malone Living Trust and with it, re-names the Nancy Malone Intern/Mentor program, establishes the Nancy Malone Directing Award at the Muse Awards, and begins development of a new program to help open more doors for women directors in television. Oprah Winfrey lends her support to The Writers Lab 2017, in addition to returning funder Meryl Streep. That year, participant Vigil Chime receives the Nicholl Fellowship in Screenwriting from The Academy. 2017 Designing Women Awards are presented to makeup artist Kyra Panchenko, hair stylist Melissa Forney and costume designer Melissa Toth. The Variety Ensemble Award is presented to the costume, makeup and hair team from the smash-hit Netflix Marvel series Jessica Jones. In Spring of 2017, the Women Filmmakers: Immigrant Stories series expands from five to ten screenings (plus the production workshop for immigrant and first-generation women) thanks to additional funding from Council Member Elizabeth Crowley. 2016 Muse Awards Luncheon honored actors Debi Mazar, Mary-Louise Parker and Martha Plimpton; Firelight Media Co-Founder and President Marcia Smith; and Bloomberg Media COO Jacki Kelley. The Loreen Arbus Changemaker Award was presented to Amy Goodman, host and executive producer of Democracy Now!. Nancy Giles returned as host. Strategic planning begins in Fall 2016 in anticipation of NYWIFT’s 40th anniversary. 2016 Designing Women Awards presented to costume designer Sarah Edwards, hair stylist Rose Chatterton and makeup artist Anita Gibson. Variety Ensemble Award presented to the costume, makeup and hair team of The Affair. 2015 Muse Awards Luncheon honored Gabourey Sidibe, actor; Blythe Danner, actor; Patricia Clarkson, actor; Sarah Barnett, President and General Manager of BBC America; Victoria Alonso, Executive Vice President of Physical Production at Marvel Studios. The Loreen Arbus Changemaker Award was presented to producer, comedian and activist Lizz Winstead. Nancy Giles hosted. The Sabrina Wright-Gilliar Award is established in 2015. The scholarship, created in honor of the legendary props master, is given annually to a female graduate of the Academy for Careers in Television and Film (TvF) in Queens. 2015 Designing Women Awards presented to costume designer Ann Roth, hair stylist Francesca Paris and makeup artist Beverly Jo Pryor. Variety Ensemble Award presented to the costume, makeup and hair team of Orange is the New Black. In 2015, NYWIFT establishes its annual Women Directors: Immigrant Stories Series with the support of the Department of Cultural Affairs and Councilwoman Elizabeth Crowley as part of the Cultural Immigrant Initiative of the New York City Council. The series includes five screenings by female directors and/or producers about the New York immigrant experience, plus a one-day media production workshop led by instructors from Third World Newsreel. NYWIFT creates its annual From Script to Pre-Production (FS2P) Program, run by member Elizabeth Page, a six-month intensive in which women writer-directors learn to create pitch packages for independent low-budget features. In partnership with IRIS, NYWIFT creates The Writers Lab for women screenwriters over 40, funded by Oscar winner and Muse honoree Meryl Streep. The Lab will be presented annually in the early Fall. 2014 Muse Awards Luncheon honored Mary Bailey, script supervisor; Maggie Gyllenhaal, actor; Dawn Ostroff, President of Conde Nast Entertainment; and Wanda Sykes, actor. The Loreen Arbus Changemaker Award was presented to filmmaker Abigail Disney. 2014 Designing Women Awards presented to costume designer Renée Ehrlich Kalfus, hair stylist Kerrie Smith and makeup artist Evelyne Noraz. Variety Ensemble Award presented to the costume, makeup and hair team of The Angriest Man in Brooklyn. 2013 Muse Awards Luncheon honored Ellen Barkin, actor; Connie Britton, actor; Robin Wright, actor; Sonia Manzano, actor and writer; and Frances Berwick, President of Bravo and Oxygen Media. The Loreen Arbus Changemaker Award was presented to director, producer and actor Nancy Malone. 2013 Designing Women Awards presented to makeup artist Andrea Miller, hairstylist Mandy Lyons and costume designer Deborah Scott. The Variety Ensemble Award presented to the costume, makeup and hair design team of The Americans. 2012 Muse Awards Luncheon honored Mariska Hargitay, actor; Lucy Liu, actor; documentary filmmaker Lisa F. Jackson and Kim Martin, President WE tv. The Loreen Arbus Award For Those Who Take Action and Effect Change was given to Women Make Movies and its Executive Director Debra Zimmerman. Established the Nancy Malone Marketing and Promotion Grant and the Ravenal Foundation Grant for woman filmmakers. 2014 Muse Luncheon honored Maggie Gyllenhaal, actor; Wanda Skyes, actor: Condè Nast Entertainment President Dawn Ostroff, and Mary Bailey, script supervisor. The Loreen Arbus Changemaker Award was given to Abigail Disney. 2010 Muse Awards Luncheon Honored Cindi Berger, Chairman and CEO of PMK, Pat Swinney Kaufman, Executive Director of the New York State Governor’s Office for Motion Picture and Television Development and Deputy Commissioner of Empire State Development, Abbe Raven, President and Chief Executive Officer of AETN and Vanessa Williams, Singer and Actor. 2011 Designing Women honored Janie Bryant, Linda Melazzo, and Diana Sikes. The Nurse Jackie hair, makeup and costume design team were also honored with the Variety Ensemble Award. The event was held at Macy’s. GM sponsors Muse Awards, Women’s Film Preservation Fund/Tribeca Film Festival event, and scholarship. NYWIFT kicks off our 20th anniversary year. The centerpiece of the celebration will be The Feminine Eye, an international women’s film festival. 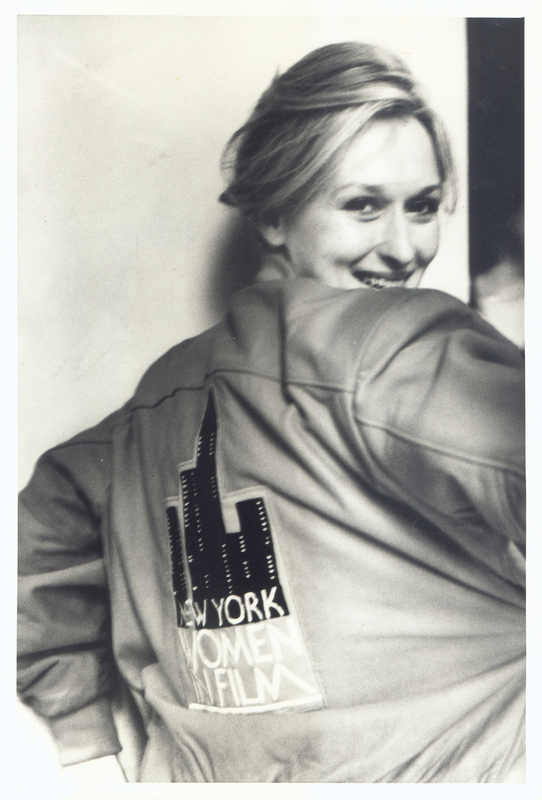 NYWIFT also conducted the “put it in the can!” campaign, to raise additional funds for our Women’s Film Preservation fund. Spring event: NY premiere of Penny Marshall’s A League of Their Own at the Ziegfeld Theatre, followed by an elegant barbecue supper and dancing at Tavern on the Green. Several celebrities attended, including Penny Marshall, Madonna and Robert de Niro. NYWIF shared proceeds with the Sloan Hospital for Women of the Columbia-Presbyterian Medical Center. The evening was sponsored by Columbia Pictures and Revlon. Membership recruitment, organizational bylaws and structure established, including board terms (2 years), membership requirements (3 years professional experience), and the determination to remain autonomous from the LA chapter. First NYWIF roster published, listing the organization’s 52 members. New York producer/director Lenore DeKoven and Hollywood Reporter bureau chief Morna Murphy-Mortell call a meeting of 25 female colleagues in Dekoven’s Manhattan apartment to discuss the possibility of forming New York Women in Film — and suddenly the lights went out all across NYC. Could it have been the creation of NYWIF that was the power surge causing the New York City blackout of 1977? The first chapter of Women in Film is founded in Los Angeles by The Hollywood Reporter‘s Tichi Wilkerson. The group would serve as a power network to counterbalance the LA old boy’s network.